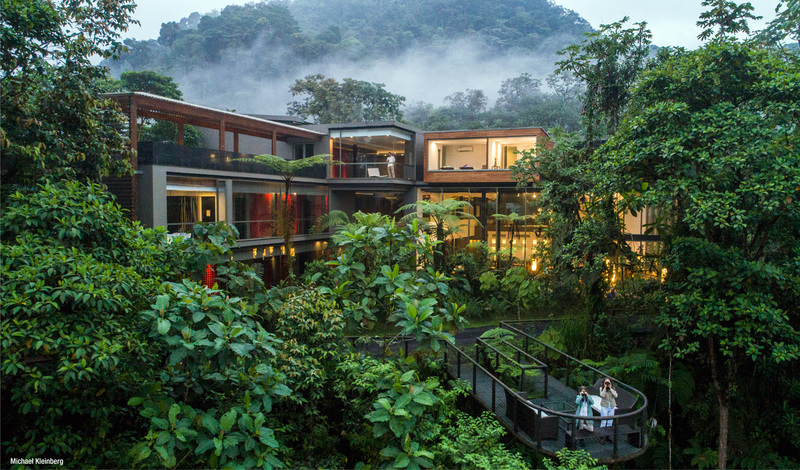 Through a mass of emerald-hued trees and low lying mist cloud forest mists, an ultra-modern 23-room sanctuary crafted from steel, stone and glass is nestled. Mashpi Lodge. Sitting 950 metres above sea level, it is the only building for miles around; completely immersed within the Chocó Cloud Forest you can watch endemic butterflies and birds flutter past its panoramic floor-to-ceiling windows and see animals scurry pass from the open-air terrace. Paired with an Ecuadorian fine dining experience and immersive forays into the jungle and Mashpi will leave you floating on cloud nine. Surrounded by a wild and mountainous 1,200-hectare reserve, it’s hard to believe that Mashpi lies just a three-hour drive away from Quito. Hidden away amid the Chocó Cloud Forest, Mashpi has few neighbours beyond the 400 species of birds, monkeys, peccaries, pumas and other endemic species that have only recently been discovered. Teeming with incredible wildlife that you will never have seen before, you may even discover a whole new species too. 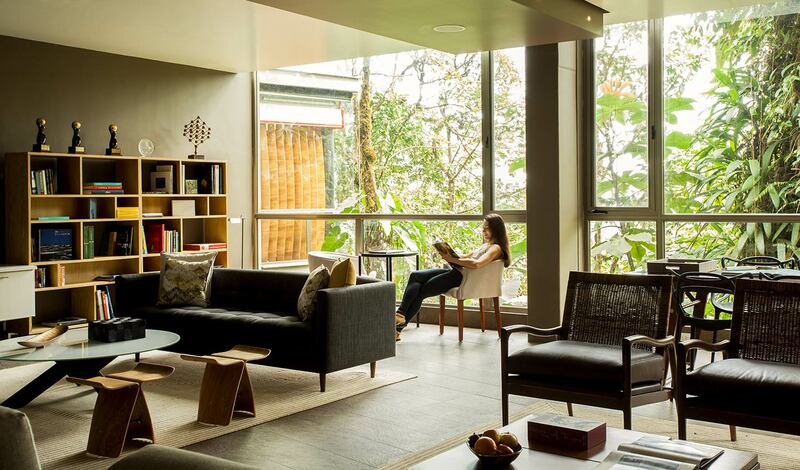 Each of the 23 at Mashpi have been built with the intention of completely submerging your senses in the Cloud Forest with floor-to-ceiling windows running the length of one of the walls. Incredibly spacious with a minimalist and hyper-modern design, grey stone floors and white walls serve to accentuate the green of the cloud forest outside. Open your window to listen to the melody of birds singing and frogs croaking and rest assured that you are in a place unlike any other. The design in itself is enough to fall in love with Mashpi. Yet, it is the jungle activities that will make staying here even more memorable. Explore the tree canopy on the SkyBike, marvel at the beauty of colourful creatures up close in the Hummingbird Garden and turn your hand to conservation in the Life Centre where endemic butterflies are bred, before getting your heart pumping on the Capuchin Monkey and Strangler Fig Trails. After all, the Cloud Forest is there to be explored; not just admired.